I have an interesting assignment coming up which has taken quite a bit of preparation. I'm headed to Ghana to shoot some mining for a long time client of mine. I have photographer throughout South America, Southeast Asia and the United State for more than 13 years for them. This will be the first time shooting in the country of Ghana, I'm looking forward to the experience. My Visa has been finalized and I've had all my immunizations. Yellow fever shots, Tetanus, Diphtheria, Polio, Meningococcal and I've started my 4 doses for the prevention of Typhoid fever. I have a large list of photos to take, it will take at least a full week to complete the assignment. I have to pack my gear carefully, I'll need some lighting and a few modifiers, stands and various grip equipment. I'll be traveling with my camera roller (Think Tank International), a personal bag and another roller carrying stands, modifiers and grip gear. I'll give you the full details on the gear and the trip a bit later. I did a recent shot in the studio and I thought I's share that with you here. Normally, I shoot studio still life using my old studio strobes. 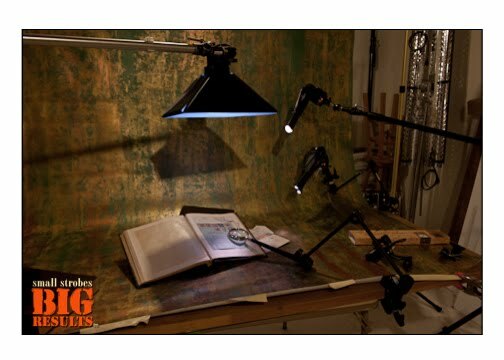 The provide a modeling light and it is much easier to see your lighting position at any given time. I wanted a bit of a challenge and decided to use my SB-800's with just LumiQuest modifiers. Here is what I did. Let me tell you about the photo above. As many of you might remember, my father passed away about 3 years ago. 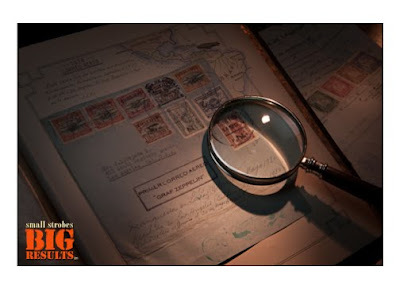 I was left with his childhood stamp collection, stamps from around the world dating back to the 1850's. In going through his collection I found the follow item. One of the albums was actually my Grandfather's, he was the president of Bolivia in the early 1940's. The album contained a letter that traveled on the Graf Zeppelin from South America to Los Angeles. I thought it would make for a wonderful photo. Here is the set-up. I used a total of 3 Speedlights, 2 with LumiQuest Snoots and 1 fitted with the Softbox LTP. The Softbox over the set was used for a fill light and the Snooted Speedlights as the main and detail light. Here's a photo of the set.